Burning wood for cooking and warmth provides comfort on a chillyl morning. 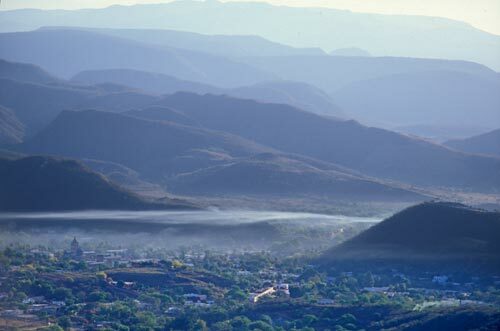 Álamos, at sunrise, seen from Tecolote Hill high up the Sierra de Alamos foothills. Off to the east the Sierra Madre foothills climb into rising mountains and plunging canyons. Over town, a low-laying-gauss-like smoke blanket will linger through the early morning stillness and move off with the first breezes. One can hear the church bells ringing from this vantage point and an occasional loud vehicle. Other than that it is the sounds of insects and cold air turning warm. I wonder how many people have shared this view over the centuries and eons. This up close and personal view of Álamos was made possible with a 500mm lens. 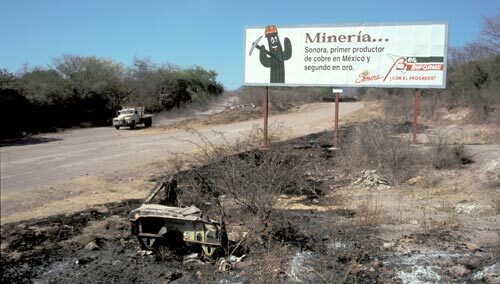 The sign says it all: Sonora is Mexico’s premier copper producer and second in gold. Mexico, overall, is rich in natural resources. It is the world’s second largest silver producer and eleventh in copper production. Álamos is seven kilometers east of the historic Aduana and Minas Nuevas mines which produced some 40 million ounces of silver. Álamos is what it is today because of the silver from nearby mining camps that began over 400 years ago. Today Álamos is surrounded by mining interests. 21 kilometers to the north-northwest is Frontera Copper Corporation’s Piedras Verdes open-pit, heap leaching copper mine. April 2005 of its open pit Alamo Dorado silver mine. In 2010, according to their website this mine produced 16,749 ounces of gold and 6,721,358 silver ounces. 7 kilometers to the west Silver Pursuit Resources is exploring silver mining options at the historic La Quintera Project. 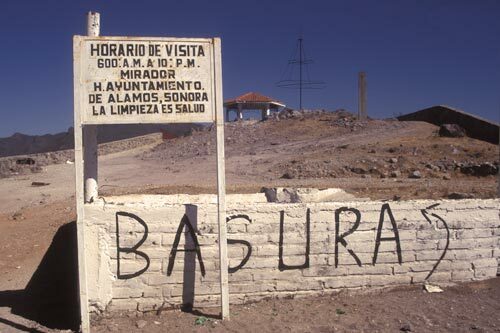 When I was last in Álamos, 1997, there was no actual mining in the region. There was talk that someday mines might reopen if the global prices were right. If one stood by this sign long enough it is possible one would see a municipal garbage truck coming from town and headed south to the dump, following the direction of the truck in the photo along the El Camino Real. It is a fine day in the Plaza. The town is alive with the sounds of summer. Plaza de las Armas on a brillant summer day in the Cuidad de los Portales. The Plaza is bewteen Juarez and Victoria streets, on the corner of Cardenas street. 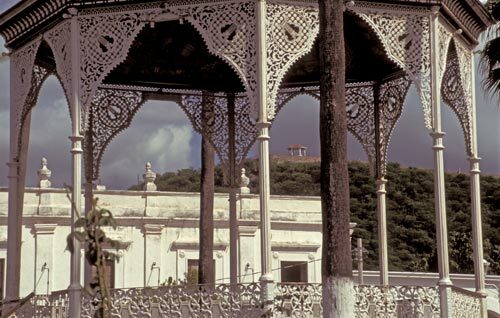 The Moorish style bandstand came in 1904 from Mazatlan. Bishop Reyes Cathedral, or Cathedral of Our Lady of Conception, was built between 1786 and 1804. Álamos is considered by many, thanks to the skills of.early architects from Andulusia, Spain, as being the most colonial city in Mexico. 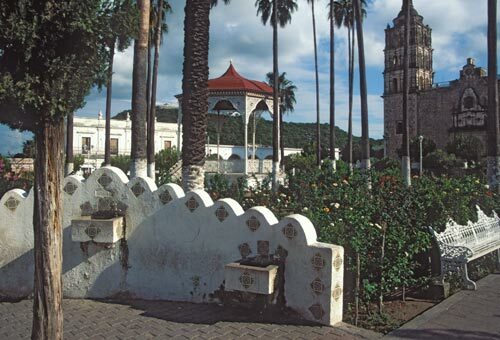 The Plaza, with the church, Museo Costumbrista de Sonora, hotels, tourist office, convent, Alamos Hotel Ruin, bank, juke box, art gallery and private homes was the center of social activities. surrounded by buildings of culural and historic importance. If you can clearly see the Mirador the Mirador can clearly see you. The old days are always with AÁlamos, Sonora, Mexico, they are in the details, textures and patinas. They can be seen in the work that has been done over and over throughout the years. East of the Plaza, rises Cerro del Perico, hill of the parrots, and the inspiring 360 degree panorama from El Mirador, the Viewpoint. The Mirador provides an understanding of where one is when they visit, or live, in Álamos, Sonora, Mexico. It would be hard to miss this trash enclosure as you go up the road to the top. One fine 1993 winter evening Anders conducted an informal poll with a small group of young school girls taking in El Mirador vistas. The question was what did they want to do in the future? They giggled and answered mafia wifes. A fringe benefit of being a mafia wife, they thought, was that their husbands most likely would die young and the gangs was obligated to take care of the widows for life. These were the days that the drug gangs did not show up the government. They had a place, their place. They were there, certainly not invisible, but ignored if they stayed out of the headlines. 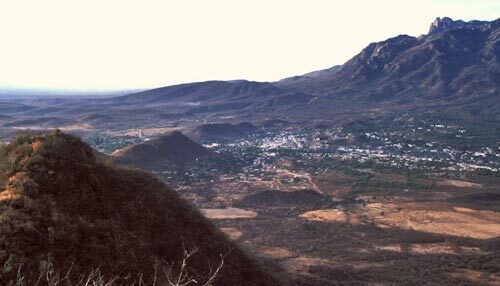 As contextual background for this story, in 1996 the Álamos police chief, a retired Sonora State highway patrolman, proudly told me Alamos had the lowest crime rate in Sonora. Ramon Salazar, raised in Álamos, was a big gangster in the region at this time. I was told he was involved with marijuana and his soon to be wife, Poppy, was involved with opium. Their large wedding reception was held at the old Alamos Hotel, on the Plaza, during the 1993 Christmas holidays. A large big band was hired and arrived from Mazatlan in their painted bus with sparkling sequin-studded band uniforms and bright shiny instruments. A couple of our film crew dropped in, and filmed a couple of songs, at the reception. Later, I heard Ramon skipped payment on the band, hotel and beer. And that was that. What are you going to do? Ramon Salazar died a couple of years later traveling with his mother and brother on a back country road near the Sonora capital of Hermosillo. After being shot, Salazar got out of his car and walked towards the police with one of his arms blown away. The police asked if he was spending lots of money. Salazar asked them to ” end me now”. They did. He died, of seven gunshot wounds, in his mother’s arms. He is buried in the Álamos cemetery. There was probably a song written about the life and times of Ramon Salazar. What is, and what was, depends on circumstances, times, places, relationships and everything moves and changes with the winds of history. 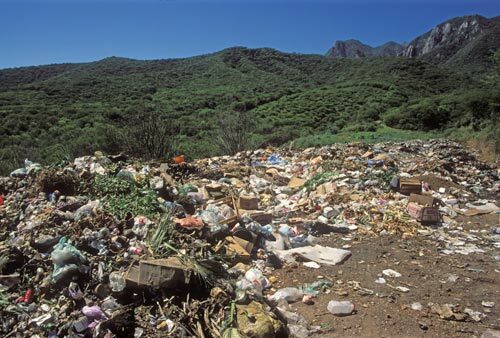 The Municipal dump is a short distance to the southeast of Alamos. One can tell much about a civilization by examining its dump. During the summer, Antonio Figuerroa and I walked to the Asoc. Ganadera local de Alamos building next to Pemex gas station off the Alameda.. Here Ernesto Alcorn, a veterinarian and ranching association officer, had his office. We hopped in his small pickup and headed for the dump. Soon we were headed south of town driving on the dirt old El Camino Real. Antonio and Ernesto wanted to make a video about the dump and its black water that reaches the Cuchujaqui River. Their goal was to send the video to a Mexican TV channel contest. The winner would receive a video camera, VCR and TV set. Both young men were concerned about the dump’s environmental impacts and wanted to bring attention to its condition. I wonder about the dump today. I went on the internet to find any current information. There wasn’t any. But in the search I came across a book by David Yetman, Sonora, an Intimate Georaphy, which begins with a 24 page chapter, Álamos. The opening sentence is “Go see see Álamos, David, there’s no goddamn place like it.” The 264 page book was published November 1, 1999 by University of New Mexico Press. I enjoyed visiting Álamos through David Yetman’s experiences. Down in the valley Alamos begins another day in the circle of life. The smoldering dump, directly above El Mirador, can be seen tucked up against a distant foothill. Its smoke plume, for the moment, is headed in a south-easterly direction. On the hike to this vantage point we followed two men and a supply loaded burro. They were headed to their mining interest. At a fork in the trail we went left where they had went right. The quiet became louder.